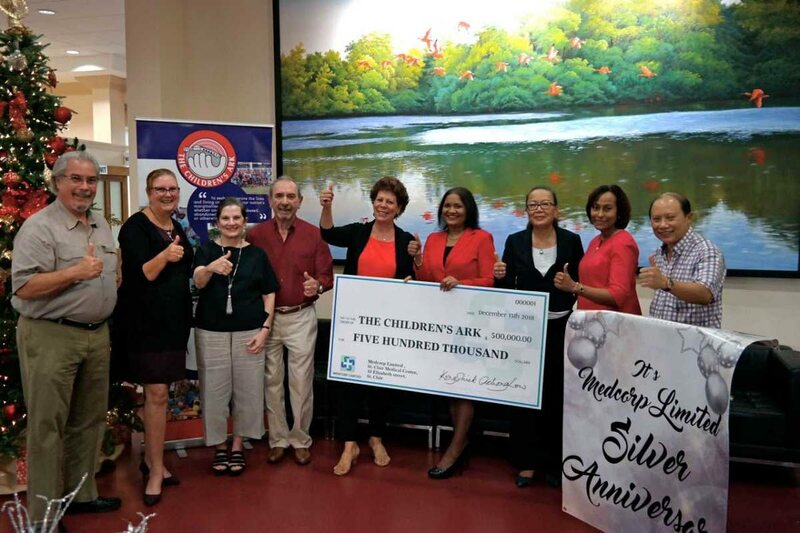 Directors of The Children’s Ark: Danny Montano, left; Carolyn Hart, treasurer; April Bermudez; Michael de la Bastide; Simone de la Bastide, president; Vera Mangal, chief accountant, Medcorp; Joan Auguste; internal auditor and marketing manager, Medcorp; Josanne Rock Pantin, nursing administrator, Medcorp; and Dr Kongshiek Achong Low, vice president, The Children’s Ark. Medcorp Ltd donated $500,000 to The Children’s Ark as part of the company’s “giving back to society” as it celebrates its 25th anniversary. The Children’s Ark has been involved in a number of projects to assist at-risk, challenged and marginalised youth. The organisation has been involved in human trafficking awareness campaigns and will again partner with the Counter Trafficking Unit on a three-month nationwide child-trafficking awareness campaign, the release said. It is also currently working on several other projects, one of them being relocating and reconstructing the surgical ward, including the operating theatre, at the Princess Elizabeth Home for challenged children in Woodbrook. Reply to "Medcorp gives $.5m to Children’s Ark"